The Columbus, Ohio, Club of the CPUSA has had a very active spring. First, we adopted a new name: the Anna Hass Morgan Club. Anna Morgan was an open Communist who lived in Columbus in the 1940s and 50s. She was active with the United Electrical Workers’ Union, and struggles against environmental racism and Jim Crow laws in the Columbus area. She was a “defiant witness” who was hounded by government about her party membership for seven years, until she won her case before the Supreme Court. Over the year before we celebrate the 100th anniversary of the CPUSA, our club educationals have focused on the history and theory of our party. With brave comrades from the party’s history as inspiration, the Anna Morgan Club is active on many fronts. We are actively campaigning for ballot issues like fair districts, prison reform and environmental justice. We are fully aware that Ohio voters supported our current president by ten points, so our electoral work is cut out for us. At the same time, our electorate is energized by the tasks ahead and by the sorry state of the scandal-ridden local GOP, who have run Ohio like a one-party state. For electoral work, Anna Morgan Club members are working with Working America (the community affiliate of the AFL-CIO) to elect gubernatorial and Senate candidates who will stand with working families and support the rights of labor. 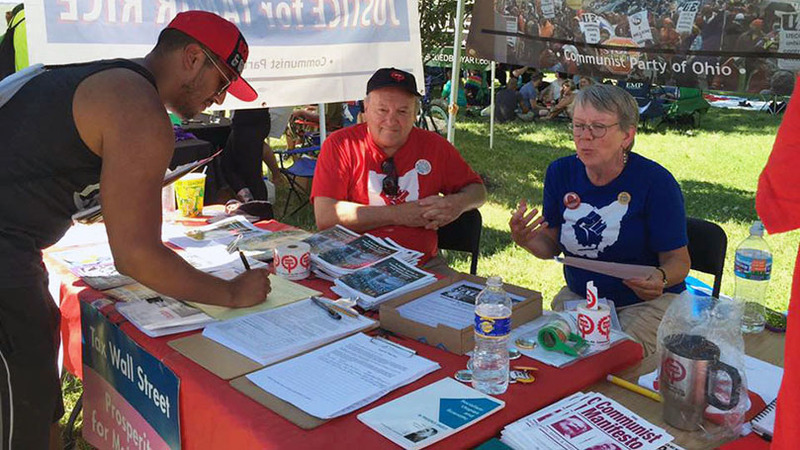 We are working locally with Yes We Can, an affiliate of the Working Families Party, to support progressive candidates, get money out of politics, and enhance democracy in the Central Ohio area. Several of us are involved in Indivisible Groups that aim to oust some of the more egregious political scumbags who have represented us so poorly in Washington in the past. Finally, we have linked up with the Poor People’s Campaign, attending weekly rallies at the Ohio Statehouse to highlight injustices that we can no longer abide. While much of our work is through mass organizations like those, we enjoy coming together as comrades regularly to share stories, discuss Party history, and develop strategies for today. At least once a month, we get together to critically evaluate the products of one of Columbus’s many craft breweries – it’s one of our duties as Communists and we’re happy to oblige.